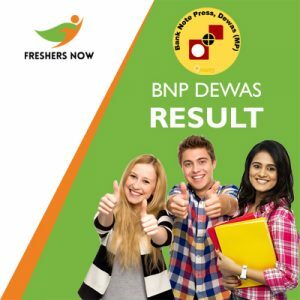 The Bank Note Press, Devas, Madhya Pradesh Board has released the BNP Dewas Result 2019 on 4th February 2019. As known, they conducted the BNP Dewas Written Exam on 16th December 2018. Hence, lot many candidates attended for the exam for the 86 Supervisor, Junior Office Assistant, Junior Technician, Other Posts. Competitors can check their result and the BNP Dewas Merit List form the active Links given below. Also, you can get the Rank Card in the pdf format form the bottom of the page. We are here, to provide you with all the details and update you every day. Keep on scrolling for more data. After the completion of the written examination, almost all the participants are very willing to know the marks of the written examination. For the sake of those ones, we have uploaded the BNP Dewas Supervisor Merit List. Along with the BNP Dewas Junior Technician Result, applicants also gather the BNP Dewas Supervisor Cut Off Marks of the written examination from this web page. Furthermore, check for more details available on this page. 1.4 How To Download The Bank Note Press Dewas Result 2019? This year the Bank Note Press, Dewas, Madhya Pradesh offered 86 posts for unemployed candidates to perform their skills in the positions of Supervisor, Junior Office Assistant, Junior Technician, Other. In order to attain that, many candidates attempted the exam and now the Results are out. Along with the Result Card, the Merit List also released by the Board of the Bank Note Press, Dewas. The immediate search for the exam holders after they have come out from the exam hall is BNP Dewas Result. The Officials will decide the Cut Off Marks by analyzing the vacancy positions at the time of result and the exam participants marks in the BNP Dewas Exam. Then, the qualifying score of the exam is decided and released. Therefore, candidates need to check them from the official site along with the result. Also, the candidates should know that the BNP Dewas Supervisor Cut Off Marks vary for every post such as Supervisor, Junior Office Assistant, Junior Technician, Other Posts. So, with this in mind, the applicants can check the Result and the Merit List form this page. As per the notice of the official board, they are going to choose the BNP Dewas Merit List 2019 of the candidates based on some characteristics. All the qualified candidates as per the marks they have secured in the exam will be informed at once in the form of Merit List. Also, you can download it from the Official website of Bank Note Press, Dewas. Keep in mind, just as you download BNP Dewas Result 2019, you can also download the Merit list pdf form the pdf link which is given below. Moreover, note that all the details of the Results, Admit Cards and updates are provided in this page. How To Download The Bank Note Press Dewas Result 2019? First, visit the Official website Bank Note Press, Dewas (MP) i.e. bnpdewas.spmcil.com. Then, a homepage of the Bank Note Press Dewas, Madhya Pradesh appears on the screen. On the home page, search for the relevant link of Bank Note Press Dewas Result 2019. Next, enter all the fields for the details required like Name, Registration Number, Passwords, Date Of Birth. Alos, enter the captcha asked for the confirmation. Once, recheck for confirmation before submission. Within a few seconds, your BNP Dewas Supervisor Result will be displayed on the screen. Hope we had given complete details of the BNP Dewas Result 2019. Moreover, we suggest all the selected candidates prepare well for further rounds of the Bank Note Press Supervisor, Junior Office Assistant, Junior Technician, Other Posts. Keep in touch with for such similar details. Also, don’t forget to bookmark our website Freshers Now. Ask us if any queries through the comment section given below.